I know, this isn't a pure "repair issue" question, but the situation did come about from making repairs. I had the brakes replaced on my 2013 Honda Accord LX, the mechanic broke the McGard key off on one of the locking nuts. He then employed a common technique of using a socket on the locking nuts to remove them. This worked will until the final locking lug-nut, and I guess by then the socket was worn out. The socket is now on the lug-nut, it will turn, but it is only spinning on the McGard lock, and will not bite into it enough to turn it. I can turn the socket and even move it up and down, side to side with an extension bar, BUT IT WILL NOT COME OFF. I took it to a garage where they tried using a slap hammer on it to no avail. 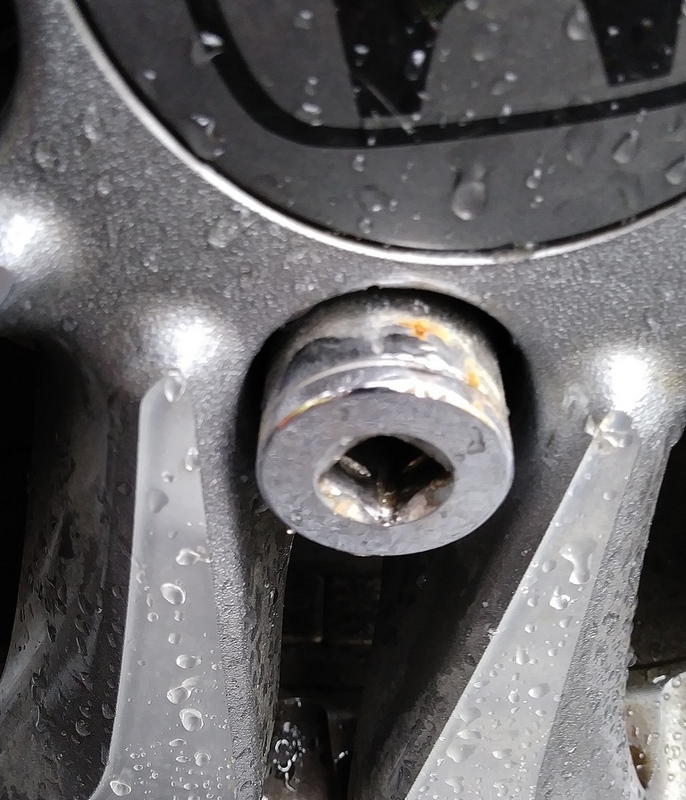 I'm hoping that someone can offer some advice on how to get this socket off without damaging the wheel. I sorta kinda can't use the car, because I'm afraid that if I have a flat with that tire I'm really up the creek. I considered cutting into the socket with a Dremel tool and cutoff wheel, hoping to expose the McGard lock again...the reps at McGard are great, I sent them a Hi-Res photo of the locking nut and they will send out a replacement key for a nominal amount. I like the idea of splitting the socket with a cutoff wheel. Once you cut through the top you should be able to split the socket apart with a chisel. If you do end up trying the wiz wheel, be sure to protect the rim. The sparks will burn the painted surface or embed hot metal in the finish. Cut one side and then turn the socket 180deg and cut the other side along with DS's suggestion. THANK YOU VERY MUCH FOR ALL THREE REPLIES...what would be the best way to protect the wheel...tape some cloth around the rim, put some heavy craft paper over it? Is there only one size cutoff wheel for the Dremel tool? My vote would be duct tape. Dave - All: Watching in dismay at this. OMG what a rock and hard place! Sorry this involves YOU so much and tech that did brakes couldn't get thru this but this problem lurked somehow could have been YOU alone with a flat and unable to change the wheel. Searched for a type of lock not just usual cloverleaf bent type lug but if there was one that would just spin as you said that socket shown just spins freely and also that it's so stuck on? Appears to be a cheap socket (not surprised to waste one if it worked) now the problem escapes me. Hey - Dremel makes a shoe box full of assorted bits and ends. That socket will probably split doesn't look like an impact one that wouldn't just BTW. Point about this. Great the lock can save you from losing the wheel(s) to fast theft but not pleased it also would strand YOU perhaps in a very unsafe spot to change a wheel at all. YOU may still lose this wheel and it wasn't a theft at all! It's losing it's intention quickly to you the rightful owner of the thing! I'd seriously consider getting rid of all of them for something that's more dependable than this for YOU or road service help as required if this happens again or just plain service for this car.